For each risk the type of mitigation strategy must be determined and the details of the mitigation described in the Risk Mitigation Plan. 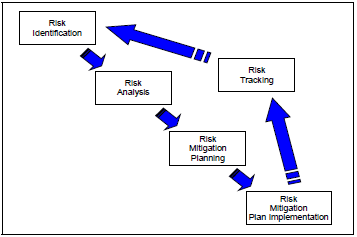 The intent of risk mitigation plan is to ensure successful risk mitigation occurs. Is when it’s decided to perform other activities that don’t carry the identified risk by eliminating the root cause and/or consequence. It seeks to reconfigure the project such that the risk in question disappears or is reduced to an acceptable value. Is when you control the risk by managing the cause and/or consequence. Risk control can take the form of installing data-gathering or early warning systems that provide information to assess more accurately the impact, likelihood, or timing of a risk. If warning of a risk can be obtained early enough to take action against it, then information gathering may be preferable to more tangible and possibly more expensive actions. Is when you share the risk with a third party like an insurance company or subcontractor. Is accepting the loss, or benefit of gain, from a risk when it occurs. Risk assumption is a viable strategy for small risks where the cost of insuring against the risk would be greater over time than the total losses sustained. For more detailed explanation on risk, visit the DoD Risk Issue and Opportunity Management Guidance for Defense Acquisition Programs – June 2015.